"What are beaded hair extensions?" Beaded hair extensions are the same as micro bead hair extensions which are also known as micro link hair extensions and micro ring hair extensions - all of these names refer to hair extensions that are attached to growth hair by little rings which look like beads... which why folks use the word bead to describe them. "What do beaded hair extensions look like?" The type of hair extensions used with micro beads are usually stick tip hair extensions which are also known as I-tip hair extensions - and they look the image to the right (click to enlarge). "Are bead hair extensions the same as micro loop hair extensions?" 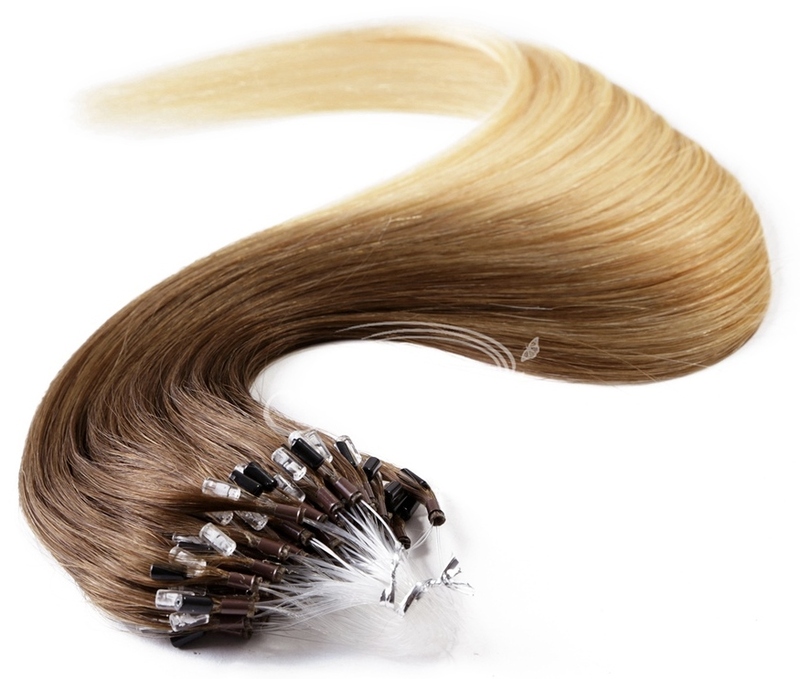 Micro loop hair extensions are the essentially the same as all micro bead (or ring, or link) hair extensions but differ very slightly as they come with pre-fitted plastic loops. The loops used to thread the growth hair through the micro rings instead of using a pulling needle - once this has happened the loop is removed and you're left with the bead (ring) being clamped closed to secure hair extension to your growth hair. Micro loop hair extensions are available in the same straight, wavy and curly hair textures, colours and lengths as micro ring hair extensions. "Are beaded hair extensions pre-glued hair extensions?" This is where it gets a bit confusing. Bead hair extensions are pre-tipped in order to hold the strands of hair together, but they aren't the type of pre-glued hair extensions that are bonded to growth hair. "Can the beads be seen?" That depends on how you wear your hair once they're in. If you wear a style that doesn't show any part of your scalp then they won't be seen. It's because of this that those with areas of thinning hair may find that micro bead extensions are not a viable method of hair extensions. "Can you go swimming with micro bead hair extensions? You certainly can; in fact you can participate in any physical activities whether it's running, rugby, rowing or anything else. However before you do anything that involves your micro bead hair extensions getting wet; there are certain steps that should be followed both before and after to avoid damaging the micro ring hair extensions. "Are beaded hair extensions bonded to your hair?" Nope. 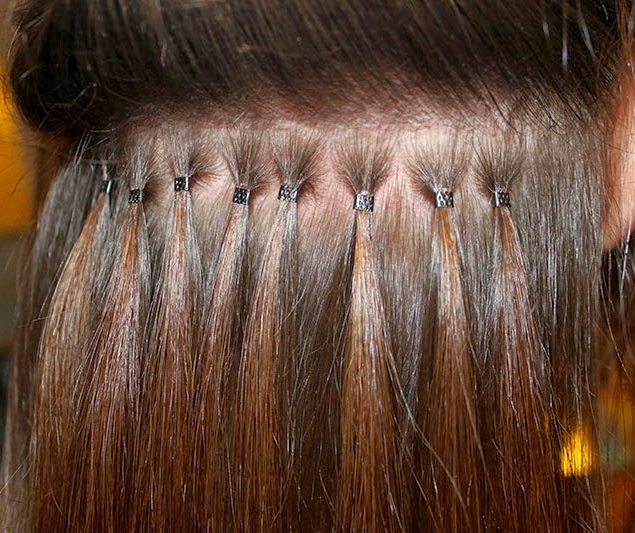 The attachment method for micro bead hair extensions doesn't require any glue or heat. The beads are used to join your hair and the hair extensions - the beads are then clamped shut with pliers. "What do beaded hair extensions look like when they're attached?" The image to the right shows what micro ring (bead) hair extensions look like when attached - click image to enlarge. "Do micro bead hair extensions hurt or cause itching?" The first time anyone wears hair extensions of any kind, there is likely to be some discomfort and micro ring hair extensions are no different. Micro bead hair extensions should be fitted about 1cm away from the scalp so that they can fall and lie flat against the head - if they're too tight, then contact the hairdresser that fitted them to have them loosened. 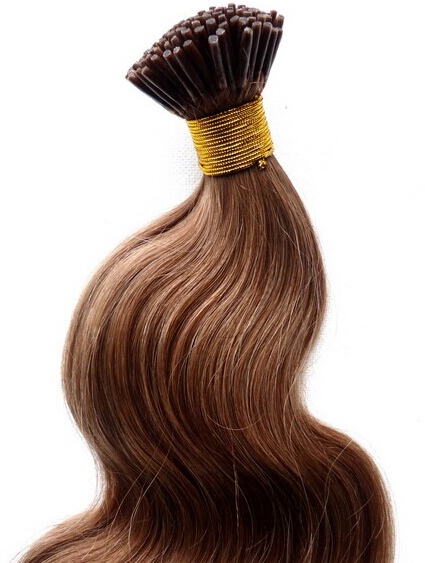 The fact is that all hair extensions add weight and if this weight is too great the scalp can become sore and redden. If this is the case, then contact your hairdresser to have more strands of your own hair for each attachment so that the weight of the hair extensions is dispersed. Sometimes scalps can be sensitive to small beads (rings) used in micro ring hair extensions as they're made of metal which can often contain nickel. If this is the case, then there's no other option other than to have the hair extensions removed. Let's call it quits on quick fire questions for beaded hair extensions, but you can always click on the links for more information about washing micro ring hair extensions and basic maintenance. There are more answers to questions about micro ring hair extensions in the Hair Extensions Q&A section, or if you'd like to keep up to date with the next guide about hair weave, hair extensions, wigs and hairpieces then join our blog.